Excavation lead Jacky Nowakowski measures the width of a trench at Tintagel in July 2017. Photo taken by the author. William Trost Richards, Tintagel, 1881, Watercolor, National Academy Museum, New York, public domain. Trade emporium? Royal complex? Tax center? Pirates’ den? 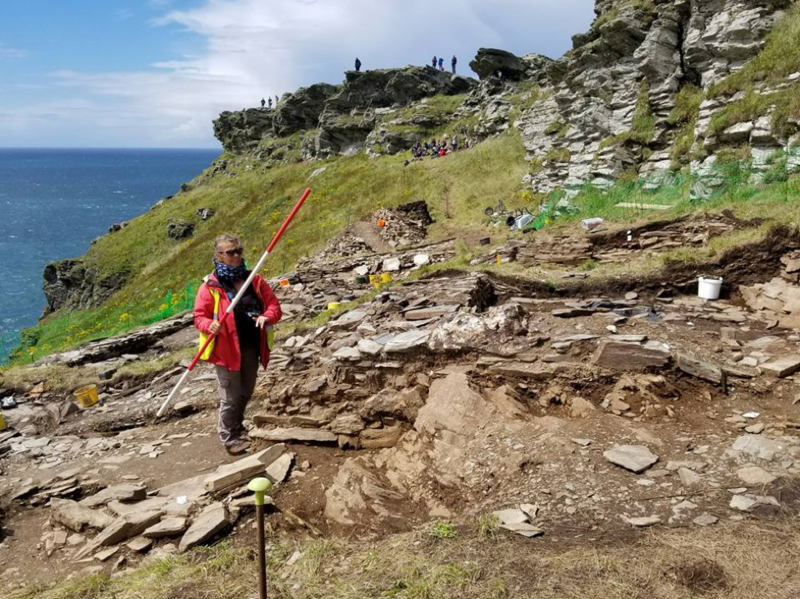 The latest excavations at the Tintagel Castle site in Cornwall, England have revealed its critical role along Mediterranean trade routes in the post-Roman era, but they present more questions than answers. Evidence has emerged suggesting that the complex was a hugely important center in post-Roman Britain, but what function did it serve? Who lived within its walls and took part in lavish banquets in which diners ate oysters served on fine Samian ware suited for a king’s table, while drinking wine from Merovingian glass goblets? These luxurious finds, as well as writing etched into the site’s very walls, hint at a much more urbane lifestyle than previously believed possible following the departure of the Romans. They also have called into question whether the supposed “Dark Ages” in England really were so dark. Uther and Merlin in front of Tintagel. 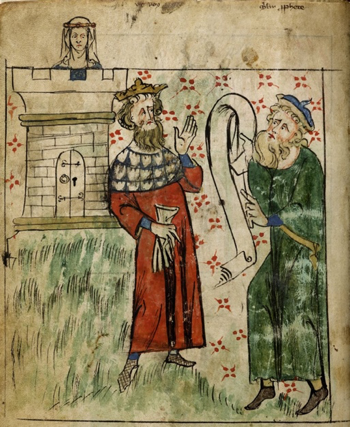 Royal 20 A II, Peter of Langtoft and others, parchment codex, c. 1307 – c. 1327, British Library collection, public domain. In the 13th century, an unscrupulous noble who owned the land sought to make it a lucrative pilgrimage location by advertising its links to the beloved king. [iii] While this claim has been debunked, Tintagel’s association with Merlin, Arthur and Camelot persists, as promoted by writers like Tennyson. The steep descent and approach from the mainland ward to the “island” in July 2017. Photo taken by the author. The site has seen sporadic excavations over the past 80 years. Both the quantity and quality of the finds suggest that Tintagel was a major regional player in the trade of the 5th to 7th centuries. A post-Roman “great ditch” on the mainland side of the complex suggests the local population may have taken a defensive stance. The only approach was via a narrow entry under a cliff, which could easily be protected. “A Coloured Plan, or Bird’s Eye View of ‘Tindegal Island’ or Tintagel Castle, near Bossiney, on the North Coast of Cornwall.” Circa 1560. British Library, public domain. A view to the mainland from Tintagel’s eastern terrace. Photo taken by the author. New excavations have uncovered more information—not just about Tintagel, but about the whole Mediterranean region. Subsequent excavations focused on a cluster of buildings on the southern terraces, which were seen in 2017 for the first time in more than a millennium. [xxxiii] They shed further light on the post-Roman world of the Dumnonii. 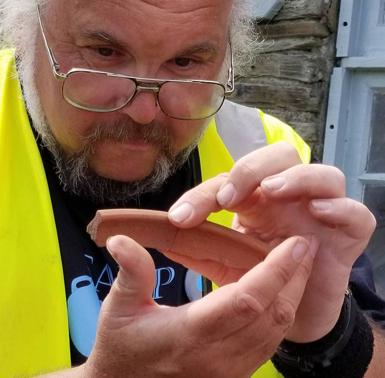 Carl Thorpe displays a potsherd found at Tintagel in July 2017. Photo taken by the author. Finds from the summer 2017 dig hint at Neolithic occupation; in addition, a Mesolithic flint form attracted the team’s attention. [xxxv] But the site’s bread and butter is post-Roman artifacts and ecofacts. A 7th-century stone covered in etched writing. Photo by the Press Association. Some posit that the carvings may have made by a young student learning to write; others speculate, due to the high quality of the writing itself, that it was etched by a scribe. Either way, the presence of such writing suggests wealthy or royal inhabitants who were privileged enough to host someone who could write. This discovery comes on the heels of another stone found on the site in 1998 that had the name “Artognou” written on it, which set off a frenzy of speculation that it referred to the legendary King Arthur. With work still ongoing at the site, there are no conclusions as to the purpose of post-Roman Tintagel. However, theories abound. 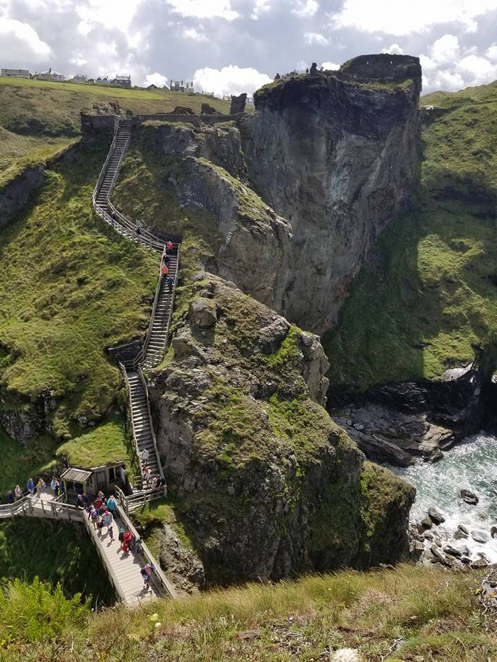 Whatever is yet to be discovered at Tintagel, it is clear from current evidence that the Dumnonii leadership thrived at least for a short period following the withdrawal of Rome. The liveliness of the trade routes of post-Roman Europe and the Mediterranean suggests a far more vibrant, connected “Dark Ages” world than previously believed. [i] Barrowman, Rachel, Batey, Colleen, and Morris, Christopher. “Excavations at Tintagel Castle, Cornwall, 1990–1999,” Reports of the Research Committee of the Society of Antiquaries of London, 74, London, 2007. doi:10.1111/j.1468-0254.2009.00246.x. [ii] Geoffrey of Monmouth, Bishop of St. Asaph. “The History of the Kings of Britain: An Edition and Translation of De Gestis Britonum (Historia Regum Britanniae).” Translated by Neil Wright. Boydell Press, Woodbridge, UK, 2007. [iii] Ditmas, E. M. R. “A Reappraisal of Geoffrey of Monmouth’s Allusions to Cornwall.” Speculum, vol. 48, no. 3, The University of Chicago Press on behalf of the Medieval Academy of America, July 1973, pp. 510-524. JSTOR, doi:10.2307/2854446. [iv] Pearce, Susan M. “The Cornish Elements in the Arthurian Tradition.” Folklore, vol. 85, no. 3, Taylor & Francis, Ltd. on behalf of Folklore Enterprises, Ltd., Autumn 1974, pp. 145-163. Accessed on JSTOR. Stable URL: http://www.jstor.org/stable/1260070. [v] Collingwood, Robert. “Roman Milestones in Cornwall.” The Antiquaries Journal, 4(2), 1924, pp. 101-112. Accessed at https://archive.org/details/in.ernet.dli.2015.282962. [vi] Scutt, Win. Personal interview, July 30, 2017. [viii] Cunliffe, Barry. “Britain Begins.” Oxford University Press, 2013, p. 9. Collection of the University of California, Irvine. [xi] Radford, C. A. Ralegh, “The Excavations at Tintagel.” The Antiquaries Journal, vol. 14, no. 01, 1934, pp. 64–65. [xii] Thomas, Charles. “Tintagel Castle.” Antiquity, vol. 62, no. 236, 1988, pp. 421–434. [xiii] Nowakowski, Jacky, and Gossip, James. 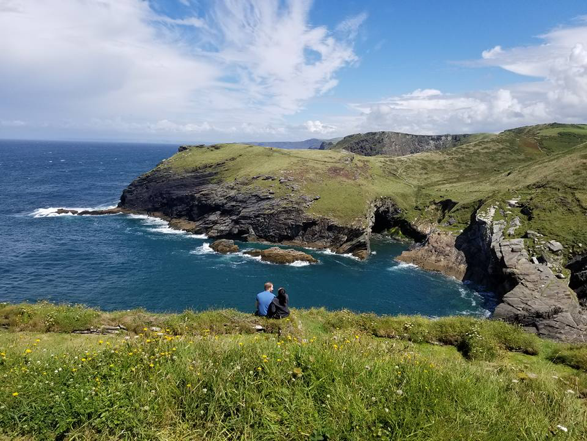 “Tintagel Castle, Cornwall Archaeological Research Project TCARP16 Archive and Assessment Report – Excavations 2016.” Cornwall Archaeological Unit, 21 June 2017. Accessed at http://www.english-heritage.org.uk/content/AboutUs/2241346/2770808/3070056/3408851. [xiv] Toulmin Smith, L. (ed). 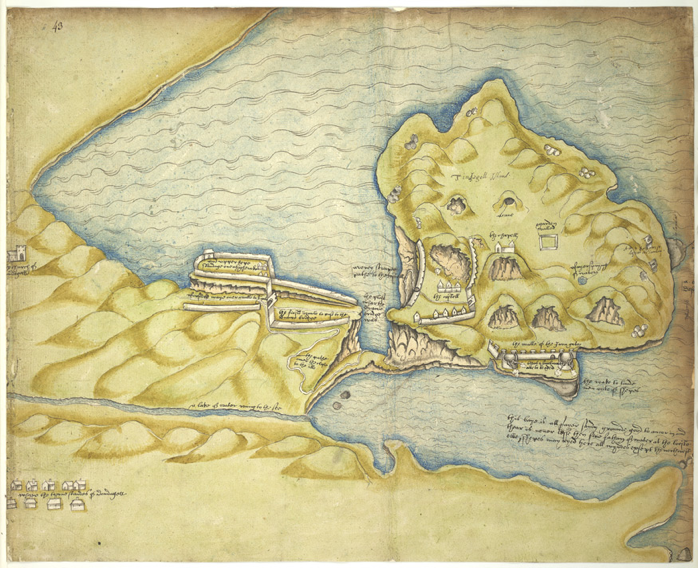 “The Itinerary of John Leland on or about the Years 1535–1543, vol I.” London, 1907, pp. 177, 316-17. Accessed at https://archive.org/details/itineraryofjohnl01lelauoft. [xv] Snyder, Christopher A. “An Age of Tyrants: Britain and the Britons, Parts 400-600.” Penn State Press, Nov 1, 2010, p. 184. Collection of Irvine Valley College. [xvi] Ashton, Gail. “Medieval Afterlives in Contemporary Culture.” Bloomsbury Publishing, Mar. 12, 2015, p. 207. Collection of the University of California, Irvine. [xviii] English Heritage. “Tintagel Castle – Winner of New Bridge Competition Announced.” 23 March 2016. Accessed at http://www.english-heritage.org.uk/about-us/search-news/tintagel-bridge-competition-winner-announced. [xxii] Gilchrist, Roberta. “Courtenay Arthur Ralegh Radford.” Biographical Memoirs of Fellows of the British Academy, XII, British Academy, 2013, pp. 341-358. Accessed at http://www.academia.edu/11336404/Courtenay_Arthur_Ralegh_Radford. [xxxiii] Thorpe, Carl. Personal interview, July 30, 2017. [xxxviii] Krakowka, Kathryn. 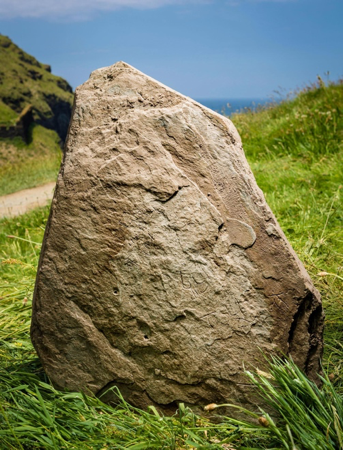 “Second inscribed stone found at Tintagel.” Current Archaeology, no. 342, August 2018. Accessed at https://www.archaeology.co.uk/articles/second-inscribed-stone-found-at-tintagel.htm. 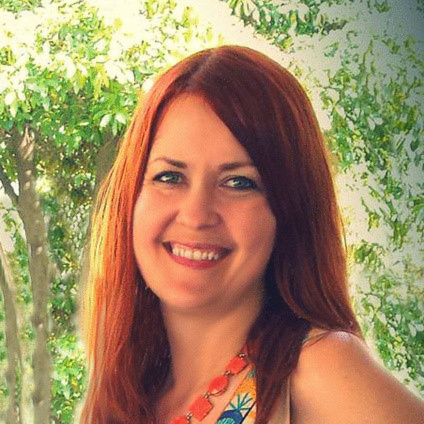 Candice Yacono is an MFA candidate at Chapman University, where she studies creative writing. She freelances as a feature and travel writer, editor, and graphic designer for clients worldwide, including the Los Angeles Times, Fodor’s Travel, and the U.S. Department of State. Candice holds a BA in journalism and international relations from San Francisco State University. She has no time for your tomfoolery. Fond memories from travel a well as harking back to days at U of Cincinnati.